We are very excited to be launching the exhibition and publication of this year long project at ArtistsWorkhouse. We are aware that there are many people in all fields of contemporary art and craft working in isolation in our rural ‘Heart of England’ region, where there are few, and increasingly fewer, facilities and venues nearby. We hope that by joining together, new and creative ideas for exhibition and project work can be explored and we can all benefit from development, learning and perhaps most importantly, inspiration and challenge. Over 60 artists engaged with the networking, talks and meetings. Carolyn Morris, Brian Cook, Deb Catesby, Dawn Harris, Chris Rider, Bryonie Williams, Helen Garbett, Bridget Rea, Cristina Celestini,Mathew Rea, Julie Swinsco, Jilly Oxlade-Arnott, Maggie Shuter, Kim Philpotts, Deb Eldred, Jane Spence, Shaun Hughes, Maria Boyle, Michala Gyetvai, Zarina Keyani, Mark Robins, Rachel Doughty, Tor Hildyard, Claire Watson, Cliff Hayward, Anna Mitchell, Ruth Judd, Cathy Jones, Karen Barlow and Sally White. 12.00pm – any other news opportunities, networking break. 1200 -12.30pm – funding discussion and questions. 12.50pm – Artists pairings for all those who would like to take part but have not been selected for the creative challenge to date. Everyone who would like to join in will have the opportunity to do so. Nov 17th, 11.00am – 1.00pm sixth layer of artists show work, discussion. Group networking and discussion through 5 separate lines of pairings. We are delighted with how our networking and creative challenge is progressing through our face to face meetings. thank you for your input and continued support of this project. The last meeting in July saw a focus on the presentation/talk, I would like to redress the balance with our next meeting focussing on the wonderful creative work that has, so far, been going on behind the scenes. I’ve had the pleasure of some really interesting conversations with some of you regarding how your initial idea has developed since the beginning of the project. In response to this I have invited a number of the artists involved in the creative project, to share with the group as a whole their progress so far. This will be by way of a very informal conversation and include showing works that have been made to date, I for one am very interested to hear what’s been happening. For those who have not taken part in the project thus far this is a perfect opportunity to come along and get a real insight into what we have and are continuing to achieve through Face to Face. Nov 17th, 11.00am – 1.00pm sixth layer of artists show work. Interim exhibition, artists talk, discussion..
12.00 Maintaining your online presence – Minimum effort, maximum output! Blogging and the use of blogs. 12.45pm Presentation of artworks in progress by: Debi Eldred, Jilly Oxlade Arnott, Kim Philpotts, Julie Swinsco, Maggie Slater. Followed by general discussion and networking. A very big thank you to everyone that attended the launch of Face to Face project and made the afternoon such a positive experience. Anne Marie Legram gave us plenty to think about with regard to being a self employed creative practitioner, I know there were a few things she mentioned that seemed obvious but had slipped my mind, and plenty I hadn’t ever thought of ! Our first 5 artists, Deb Catesby, Dawn Harris, Carolyn Morris, Brian Cook and Chris Rider presented their response to the theme of Penda, King of Mercia, each artist has plugged in to a perspective that is of interest to them, leading to an interesting and diverse start to the project both in terms of context and materials. The next 5 artists who were literally pulled out of the jar from those who attended the meeting were: Cristina Celestini, Bryonie Williams, Mathew Rea, Bridget Rea and Helen Garbett. I am intrigued to see what these artists present to the group in Face to Face part II. As part of this supportive networking project, we are asking artists to take part in a creative challenge, providing inspiration and motivation to start a new piece of artwork, and a momentum to finish it. Those artworks will be exhibited at the Little Buckland Gallery in Broadway and be included in a publication about the project. Face to Face part II is a guided visit to Little Buckland Gallery, to meet and discuss with its owner, Arabella Kiszely, factors connected with the exhibition and more general subjects connected with gallery representation. It is also intended that the visit will allow the artists time to consider their artworks in relation to the space it is going to be shown in. After our tour and discussions we will then view the 5 new pieces of work in progress and select the next 5 artists from those present to take part in the creative challenge. It is not too late to join in and take part, all welcome. Meeting at Little Buckland Gallery on Saturday 16th June at 11.00am. http://www.littlebucklandgallery.co.uk/ Little Buckland Gallery is 20 minutes away from ArtistsWorkhouse. I will be at ArtistsWorkhouse at 10.15am if you would prefer to meet there. Please do let me know if you meeting at ArtistsWorkhouse. 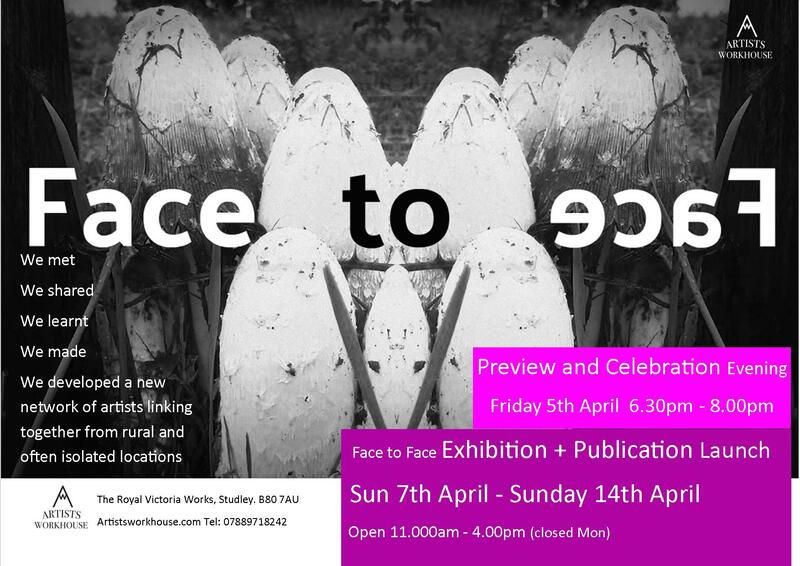 ArtistsWorkhouse is very happy to announce the launch of a new networking and creative project Face to Face. 5.10pm – 7.00pm – Presentation and Talk by Anne Marie Lagram on Becoming and being a self- employed creative practitioner- all you need to know ! 7.35pm – 8.00pm General networking and discussion time. Looking forward to a vibrant and interactive evening with lots of inspirational discussion. Everyone Welcome. The project is open to anyone to come and join in, through a programme of informal networking, talks and discussions and to express an interest in taking part in a creative challenge through 6 interim shows. Way back in the first century, Britain was ruled by warring warrior kings. Here in the Midlands, the shifting borders of the Kingdom of Mercia stretched across our lands from the Welsh border to the East Coast and from the Peak District down to the Cotswolds. King Penda took the throne in 625 and saw it rise to the most powerful Kingdom in Britain before he was defeated in battle by the Northumbrians. He was the last Anglo-Saxon King to reject Christianity and his defeat marked an end of Anglo Saxon Paganism. Penda’s name lives on in the local village of Pinvin (Penda’s Fen), near Pershore (this was the subject of a fascinating ‘Play for Today’ in the 1970s) and we all know we’re in West Mercia Police area, a term still used to describe this part of the southern midlands. We are beginning our trail of inspiration with King Penda and the physical and political landscape in which we live – neither north nor south, but in the rural Heart of England. The first 5 artists now have 4 weeks to begin a piece of artwork that in some way responds to this theme. The artwork will form part of the Launch Event on Saturday 19th May 2018. 5 new artists chosen randomly from those in attendance at the meeting will be announced at each meeting and the cycle will continue. If you’re interested, please contact Dawn at ArtistsWorkhouse (an artist-led studio and exhibition space) via email to: artistsworkhouse@outlook.com. Our first meeting is scheduled for Sat 27th January at 11.00am, where we can discuss some initial ideas and hear some of yours. Face to Face project consists of 2 parts that run within each other. Artist’s talks, networking, general discussion and invited discussion through 6 interim shows, all over 6 sessions open to everyone. Sat 27th Jan – feasibility meeting – is there a need? Sat 31st Jan– sign up to take part in creative project closes, confirmation via email. Funding application commences and continues. All networking meetings are open to all wishing to attend, invites via social media and AW newsletter. 8. Exhibition and launch of publication Spring 2019. Looking forward to seeing you on 27th January.